In honor of Father's Day coming up on Sunday, June 16th, I will be featuring three outdoor father's favorite experiences with their children. Second up! 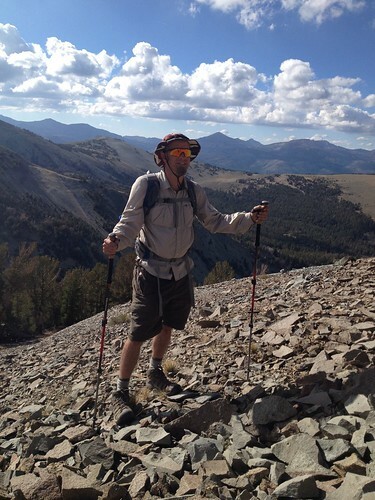 Jeff Moser has many family friendly stories, about hiking, backpacking, camping, road tripping, cycling, cave exploring, snowshoeing and much more. 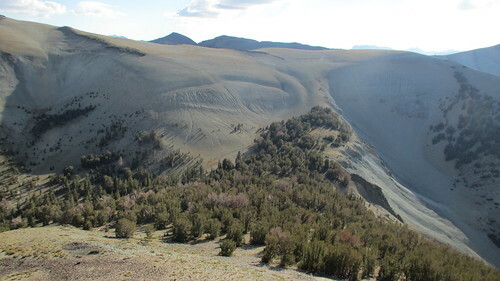 Using Carson City, NV, as his base camp, most of his outings in Northern Nevada and California's eastern Sierras. You can keep up with Jeff's progress at thepathlessbeaten.com or follow his Facebook Page The Path Less Beaten. 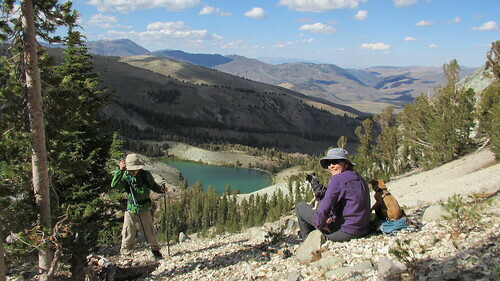 We've had the mountain climbing bug lately, and so another day hike was planned for last weekend. 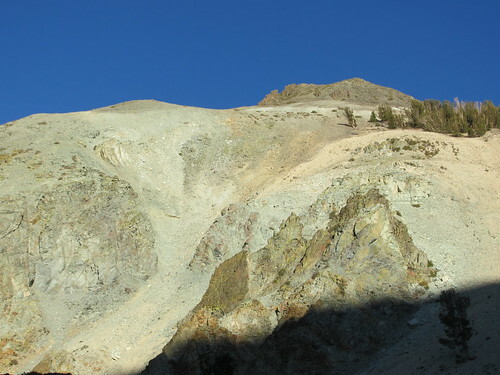 On September 9th, we headed for Mount Emma on the northeast corner of the Hoover Wilderness. We got a horribly late start that Sunday, not leaving the house until noon, and not reaching the the trailhead until 2pm. Normally, eating lunch on the peak is a good idea, so you don't get in trouble with afternoon thundershowers and wind. The late start set the tone for a nervous hike, but also lowered the expectations if we didn't make the summit. 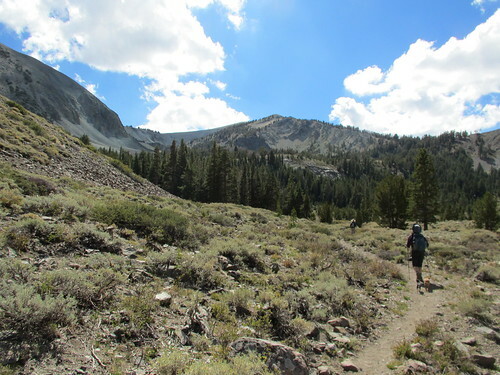 Just south of the turnoff to Sonora Pass (State Route 108), and just as Highway 395 bends to the east to head to Bridgeport, Little Walker road leaves the pavement and heads south up into the mountains. 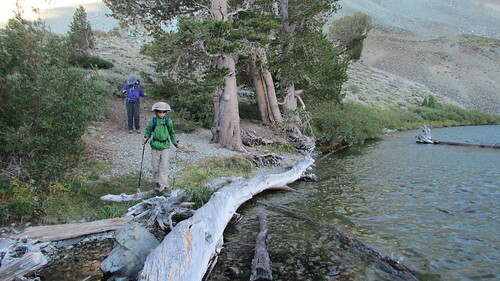 Just stay on the same road all the way, crossing the bridge, and avoiding the left turn to the Obsidian Campground. You pass a Burt Canyon Trailhead pullout, and continue to wind up the mountain to Stockade Flat. The road gets rocky at times, but is probably passable in a passenger car if you're careful. 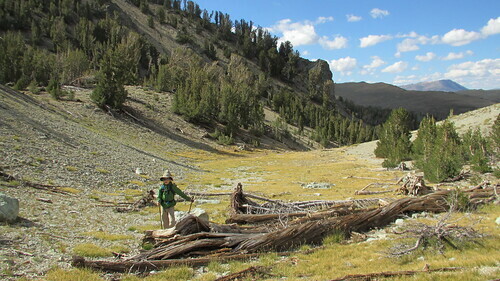 6.7 miles from the pavement, you'll reach the trailhead at a Hoover Wilderness sign. The wind was blowing pretty hard at Emma Lake, so we didn't rest too long. It was getting late, but we decided to go for the peak anyway. 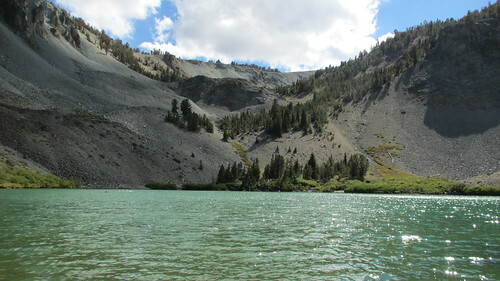 The trail ends at the lake, so the rest of the way to the peak would be off-trail. 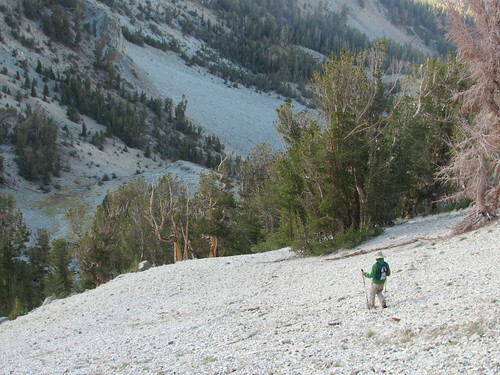 We needed to get to the saddle to the southwest of Mount Emma, and by looking at the canyon above the lake, it was easy to pick out the best route. We started up a rocky drainage on the far side of the lake. It had looked hard from far away, but the rocks were firm and the footing stable. The steep climb wasn't so bad either. Sometimes it's nice to gain a lot of elevation quickly without a lot of walking. We all had our trekking poles too, which made the climb easier. Kristy led the climb, and found the best route up. At the top of the first climb was a little meadow. It gave us a nice break and allowed us to pick out the next climb. 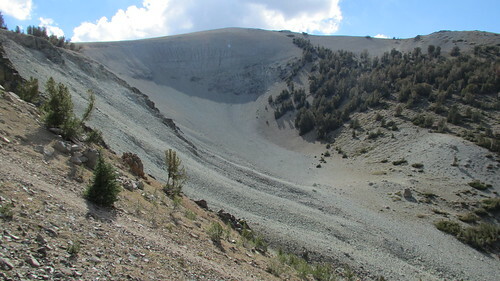 The low point of the saddle was just ahead of us, not too far up a scree slope. We were starting to feel good about making it to the top now. Emma Lake was getting smaller below us. I had looked at this area before coming out using Google Earth. It's funny how everything looks so smooth and gentle on the computer, when in reality, it's steep, covered in rocks, bushes, and trees. It's always much bigger and different than you imagine. 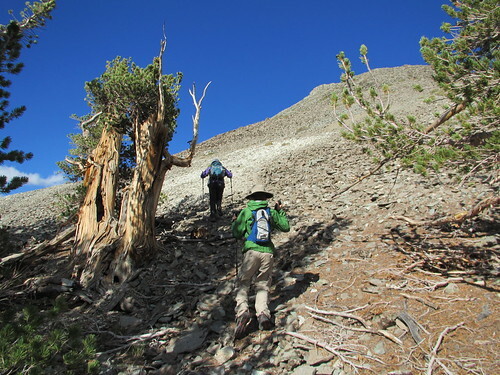 We reached the top of the scree slope, and entered a little forested area that covered just the saddle between the peak and ridge to the west. 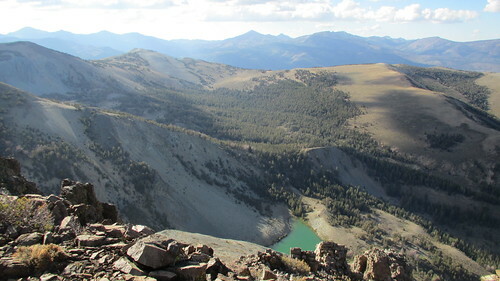 Trapped under a downed branch at 10 thousand feet was a Mylar balloon. My son looked puzzled and wondered how it got there. Somewhere, someone let a helium balloon go at a graduation party. It's wild that it made it up this far! We stuffed it in my pack for proper disposal back home. We could see the peak through the trees, and the GPS said it was only a quarter mile to the top! We'd be at the top in no time. Or so we thought. After leaving the protection of the trees, the wind really picked up. 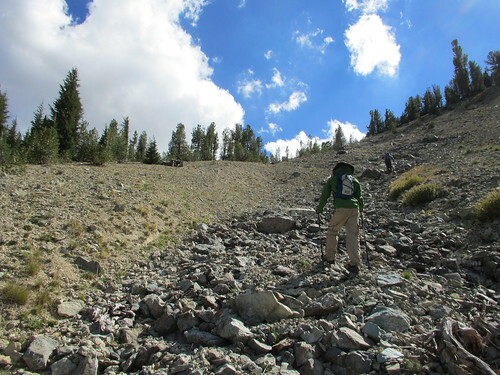 The easy walking ended as we entered the final talus slope to the top. 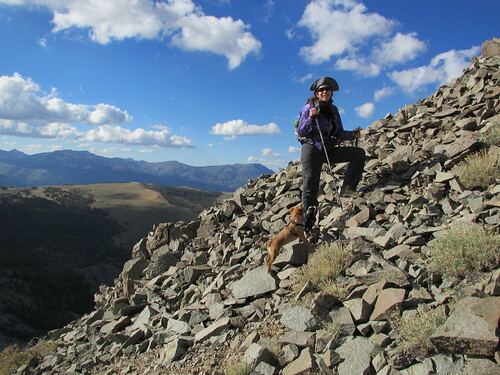 It was hard for us to keep our balance in the wind, and our little dogs were having a hard time negotiating the rocks. Eventually the Chihuahua had to be carried. 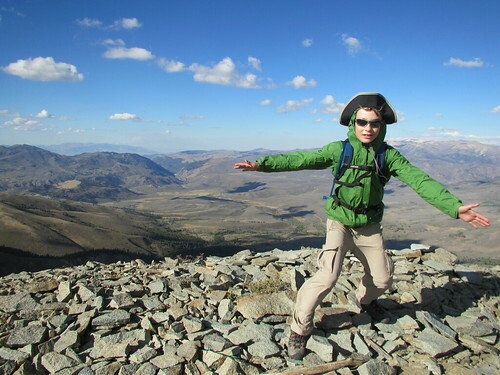 My son climbed on ahead of us and stood up on what appeared to be the peak. He held his arms up in victory. We slowly made our way up to him, and climbed over the last rock to join him. The strong wind now turned into a blast of air as we topped out. And not just periodic gusts, but heavy sustained winds. It was hard to even stand straight up. We held off the celebration of making the summit, because we weren't quite there yet. The real peak wasn't much higher, and maybe only 40 yards away. Maybe this was high enough. Nope. We all agreed we needed to finish. The dogs were shaking. They were either freezing or freaked out from the wind. Probably both though. 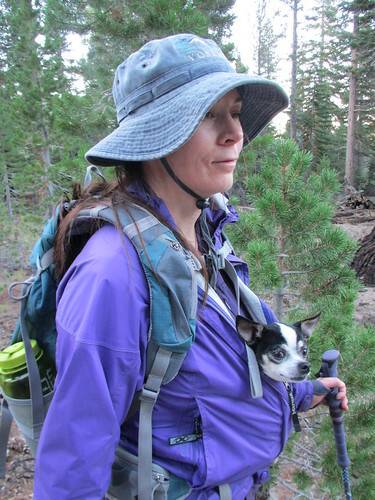 Kristy huddled the dogs in her jacket while the boy and I finished the summit. We quickly signed the peak register, took a quick look around, then went back down to where Kristy was huddled between some rocks. I took the dogs, then her and the boy went back up to the top for a look. Sometimes getting to the peak can be a relaxing. There can be time for lunch, sight-seeing, and photos. This was not one of those days though. I took a few obligatory photos, but looking around wasn't really on my mind. It was 5 pm, and all I could think about was getting the family back down the mountain before dark. Toughest part of the climb yet. Steep talus in the wind. The howling wind got me thinking that you really don't "conquer" a mountain. The mountain doesn't care if you're there or not. It's been there for thousands of years through countless winters and summers. You merely get to visit these special places for a short amount of time before you need to get going. The wind was starting to chill us fast. I zipped my pant legs on, and got into my wind jacket. Kristy's fingers were starting to go numb. We had some water and a quick snack, then tackled the talus slope. We couldn't wait to get back down to the trees! My son led the way down, getting ahead of us a bit. We slowly made our way down, being extra careful with each step on the loose rock. 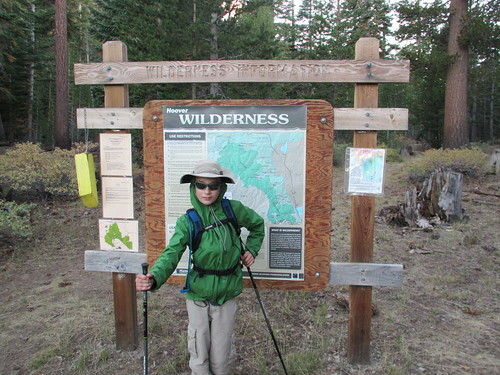 With the wind still raging, my son suddenly stopped and dropped his trekking poles. I watched with concern, hoping he was ok. When you gotta go, you gotta go. Concern changed to "oh no...", as it became apparent he was going to try to take a leak into a 50mph wind. It was a quick lesson. He twisted and turned as if he were trying to water the whole mountainside. On the bright side, it was a bit of comic relief in an otherwise tense moment. It was a big relief when we finally made it back into the shelter of the trees on the ridge. We took some time to rest, warm up, and rehydrate. After getting down that section, the rest of the hike seemed like it would be a snap. 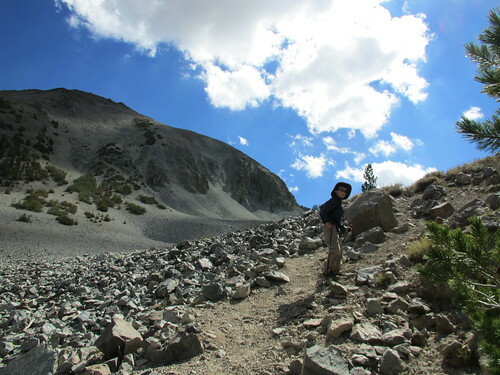 Recharged and ready for some more hiking, we made our way over to the scree slope. Going down was fairly easy, thanks to our poles and a fairly firm surface. No boots sinking into the sand and filling with rocks. We were back down to the lake in no time at all. 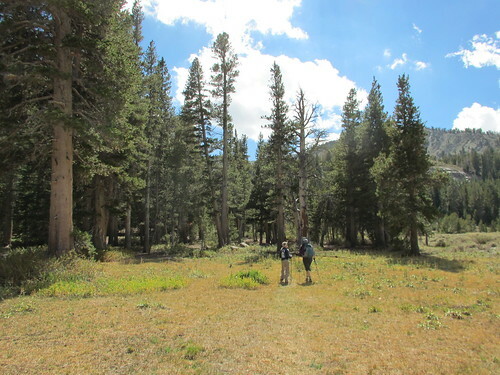 We went around the south side of Emma Lake this time, a shorter route, crossed the outlet creek, then got back on the trail. The sun was behind the mountains now, only shining far to the east on the Sweetwater mountains. 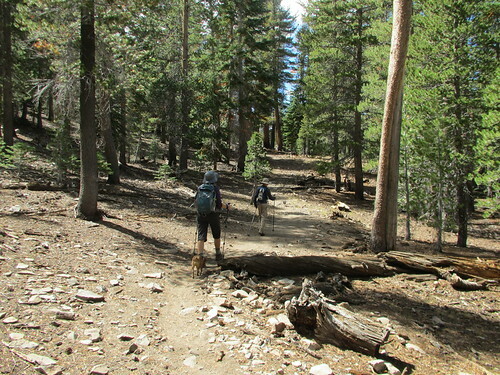 We were glad to be back on a fast trail with only a mile left of hiking. As we drove down out of the mountains, we had a feast with all the food we had brought with us, but never really had time to eat. Crackers, cheese, salami, jerky, and trail mix. It was dark by the time we made it back to the pavement. Cutting the hike so close to nightfall was a good lesson. I had even decided to cut "headlamp" out of my ten essentials packing list. Next time I plan to prepare more in the coming days before the climb, so we can just get up in the morning and go. I had left too much to do that morning. It's a lot less stressful during the hike when you know you have plenty of time to make the summit, and get off the top before the worst weather of the day hits. 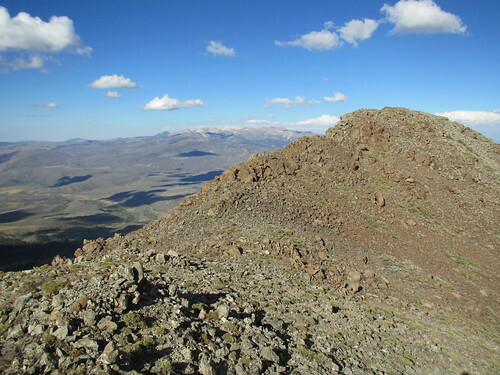 Although the view from the top of Mount Emma was not as spectacular as some of the mountains I've climbed, it was still a great hike. 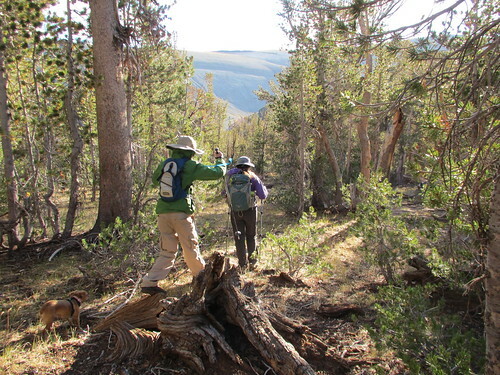 The scenery along the way was beautiful, and the off-trail hiking section added a fun challenge. Looking back up at the peak from the base of the rugged north side really makes you think, "Wow...I just climbed that!". More photos from this trip on Flickr. You can visit more wonderful posts by Jeff at The Path Less Beaten.